Surely everyone remembers Draw Something ($2.99) and its weird lifecycle of appearing out of nowhere, getting red hot, being bought by Zynga, then almost immediately falling into obscurity. If you were spending your time on the moon with your eyes closed and fingers in your ears during those few weeks, you can check out our almost-a-review here that explains how it all works/worked. In a nutshell, you got a prompt, you had to draw something, and if your opponent guesses what it is correctly you win. The weird thing about Draw Something was that seeing the cool things people were making was almost more interesting than actually playing the game- Especially as the game got Zynga-fied and previously easy prompts were replaced with obviously sponsored drawing subjects such as “doritos," “pepsi," and several other silly things. 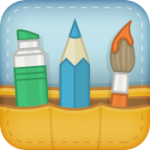 DrawQuest (Free) has a vaguely similar vibe to it, although it takes a definite turn away from the competitive aspect of Draw Something with a much greater focus on simple community collaboration. Created by 4chan founder Chris “moot" Poole, the iPad-exclusive DrawQuest gives players daily drawing prompts (or, “quests") with a scene already set- Kind of like those coloring books where you need to fill in the blanks. 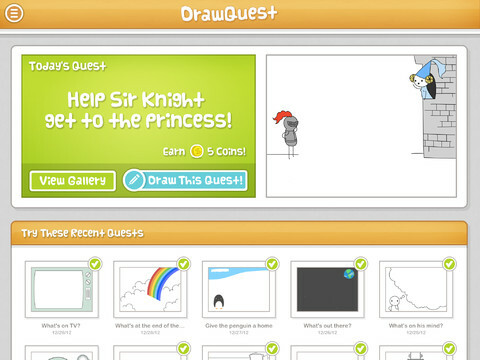 For instance, as you can see in the above screenshot, the quest is to draw something to help the knight get to the princess. Tapping it brings you to a simple drawing canvas with the knight, princess, and tower already there. So, you can draw something like a ramp, a set of stairs, a rope, or a billion other things. Submitting it gets you a few coins, and you can see what other stuff everyone else made- Assigning stars to your favorites. DrawQuest is totally free, and features a similar IAP mechanism to Draw Something in that you slowly earn coins (which you can also buy) in order to get more colors to use in your drawings. Overall the IAP feels significantly less abusive though, as the colors actually come in cohesive bundles instead of Draw Something forcing you to unlock a few colors you don’t want in order to get another simple primary color. Definitely check this game out.